Several people are predicting that 2009 will be the year of the boyband. In my mind, I believe the 90's boyband era ended around 2002 when Justin Timberlake struck out on his own to success. Yes, you can argue that the Backstreet Boys are still around, but to consider them a "boy band" would be a disservice to the respect they've cultivated after more than 10+ years as a band. There are several other contenders in this race of boy bands, including Day 26, Jonas Brothers and Menudo. But it appears VFactory and NLT seem to be at the forefront, just as Backstreet Boys and *NSYNC were in 1999 (wow, I feel old). I think it's needless to say that I'm psyched for the return of frothy teen pop (thank you, Disney, for bringing it back! ), but I find it slightly disturbing that now that boy band pop is back, I will be the older fan, who is the same age if not older than the boys themselves. ::Sigh:: First, I was too young. Now, I'm too old. Not fair. 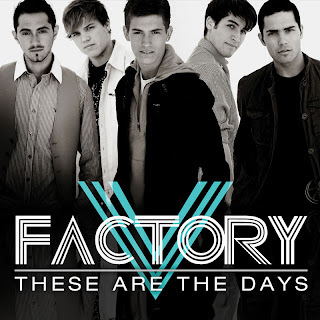 Although "Not Like Them" is a bit cliched as a boyband title, I have no clue what "V" is being Factory-ed by VFactory...Can anybody clue me in? Everyone knows that the best boy band formula isfive members. Just ask 98 Degrees. VFactory: Click here to see the routine for "Round & Round"
NLT: Click here to see the routine for "She Said, I Said"
From what I've seen so far at least.Not counting the other boys out, but in terms ofwhat's been available so far, NLT's got 'em beat.NLT has much more finesse. In true boy band style, at this point it's hard to tell which band has the stronger singers. Each have their requisite SANGER, and bothare well qualified in this arena. Universal has a much larger reachthan Warner will, not to mention an non-stop hitbrigade with Timbaland, which Warner lacks. Their album was schedule to bereleased this past February, but due to leaking, itwas pushed back to June. "She Said, I Said" hasbeen on radio airwaves since November 2007, whileVFactory is just now starting to break through interms of performances and industry gigs. Timbaland versus just about anyoneright now will still pretty much always win. NLT: "Karma" was written by Ryan Tedder, the frontman of OneRepublic, aka the superman who wrote "DoIt Well", "He Said She Said", "Bleeding Love", etctimes a million. Ms. Tisdale is a big supporter ofthe boys and helped form them from what I heard thanks to the fact that Jared and Wesley weredancers on her "High School Musical" tour. NLT: "She Said, I Said"
More radio play, more catchy...of course, this part is subjective. That song gets stuck in my brain and goes "round and round" until I want to bash my skull in. But in a good way. WINNER: NLT. For now at least. You need to check out V Factory's first official single "Love Struck"